Why Us? We’re The Real People Business Directory! | Accounting Questions, Tax Tips, Personal Finance Topics and More! Why Us? We’re The Real People Business Directory! There’s an abundance of information online but Quantity DOES NOT equal Quality…and that’s “WHY US”. BookkeepingHelp.com is the Real People Business Directory. Launched in 2001 by real people, my wife Cheryl, and me, BookkeepingHelp.com contains business listings of real people, our customers. These customers are small businesses across North America that have said “yes” I do this and I’d like other real people to find me so I can see how I can help them. The directory is 100% hand-edited! We’re not order takers and not everyone can list on our site. Each business has been reviewed before being published. If they’re not a good fit, we won’t accept their money, period. Our site is a “niche” directory; we only work with professionals in the Accounting, Tax and Bookkeeping Industry. We feel it’s important to know our customers and over the years we’ve learned just what these folks do. Each business snapshot is designed to highlight their services and the services the real people are seeking. We stay in touch, as a matter of fact; we telephone every single client that signs up to be listed on our site. While we can’t know everything about each business’s service and don’t personally endorse them, we’re confident that our directory information is current and useful. Our directory, BookkeepingHelp.com, will provide you with REAL information that you can use right now. 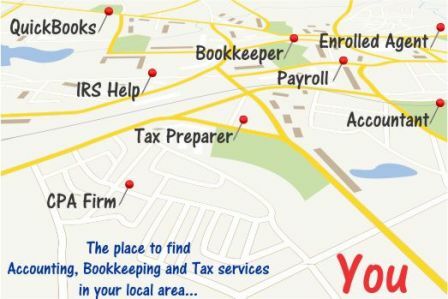 We hope you’ll spread the word that you found your new accountant, bookkeeper or tax preparer here! While this is our livelihood, we take a lot of pleasure in knowing that we’re making a difference by helping firms and consultants grow their business and supporting the local economies by “keeping jobs at home”. Have a question or suggestion? We’re interested in talking to you, too. Leave a reply, send an email or call us.